Android Wear is now an app on iOS that can work with the iPhone. This is huge news. First, let's go through a bit what it does and then why now. 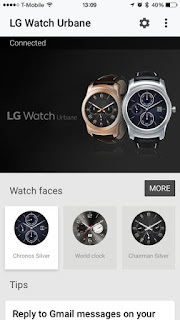 What it does is allow the user to access their Google-based information on compatible Android Wear watches (so far, looks like only one LG model works with more compatibile devices on the way) to be connected with Apple's iPhone family, second biggest mobile OS after Android itself in terms of market share. You can access weather, flight information, and some notifications. It is likely anyone who uses iMessage or Apple's dedicated apps will be out of luck in terms of notifications. But if the user or users live in the Google world, that really does not matter all that much. Now comes the why. There are two main possibilities. Google does not want to cede the lucrative iOS market to just Apple even though Apple offers a much more integrated Apple Watch and Android Wear will only offer a subset of Android Wear functionalities due to limitations Apple put on app and hardware developers. Google figures 100% of nothing is still nothing and it'll take what it can get. And what's more, should iPhone users want more from Android Wear, well, then they best get an Android device to pair with it, won't they? Second possibility is what the Apple Watch is doing to the market. Perhaps greater share of iPhone users are buying an associated Apple Watch than Android users are buying an Android Wear device. Hence, if iPhone users are more likely to buy a watch to pair with their iPhones, it makes sense that Google will try to muscle in a bit regardless of how limited it might be. The true reason is likely somewhere in between. Do not be surprised if Apple offers more iOS apps for the Android beyond Apple Music. Apple has been hiring more Android developers and it's likely a suite of Apple apps will be showing up on Android in the coming year. So, it will go both ways. It really does not hurt either companies to offer wearable apps on each others platform. Wearables are the next battleground for tech companies. And for mobile warriors, the more competitive the markets are, the better they are for us.